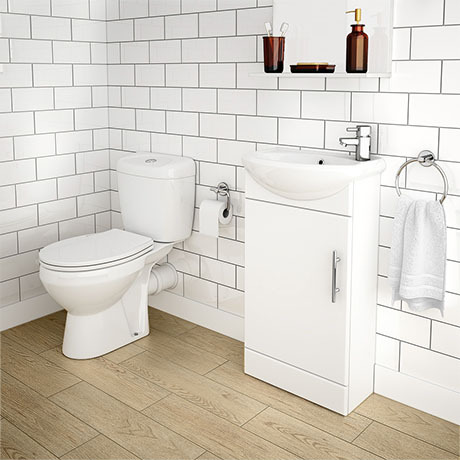 The stylish Melbourne close coupled dual flush toilet with slim white 420mm cabinet and basin set, part of the Sienna furniture range, features a modern clean white gloss finish and a quality 1 tap hole ceramic basin. This modern cloakroom suite is perfect for a en-suite or small bathroom. Q. Does the basin come with a plug? Q. Does this toilet have a soft close seat. If not, do you have/recommend one that fits this toilet? 0 out of 6 found this question helpful. "Excellent set for a basic cloakroom, well packed and delivered on time." Fantastic. As simple as that! I have not plumbed it in yet however for the price it is great value and looks good. he only reason i did not give it a 5 star on the build quality is that the toilet seat is thin plastic and really flimsy so i will go out and buy a new seat for it. The sink unit is also quite low,Great for the kids but for somebody who is tall like myself a bit difficult to use. But saying that it is a sink only used for washing hands.